The Reg Miller Award is the onion industry’s highest honour. Open to anyone passionate about the industry, the award recognises people who have made outstanding contributions to the Australian onion industry. 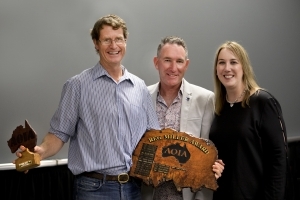 The award is named in recognition of Reg Miller, a South Australian who helped found Onions Australia. He worked on the family farm for some 20 years, served with the Australian Infantry in Darwin during World War Two, and throughout his life served on multiple committees in support of grower associations, including Onions Australia. Nominations for the Reg Miller Award are open all year round, and close on the 1st of August each year. The award is not necessarily presented every year: only when suitable nominations are received. The recipient is announced at the Onions Australia Annual Conference and Levy Payers Meeting.